New York, N.Y. – The annual $30,000 Rea Award for the Short Story is awarded to STUART DYBEK. With three distinguished collections of short stories, Stuart Dybek has created his own country.The coast of Chicago is his landscape, one he has inhabited, pondered, remembered and made hauntingly real. Dybek’s fictional Chicago, set in the poor parts of the city during the 1950’s, is full of immigrants. Most of these are eastern Europeans, hurled by the explosion of World War II into a harsh and unforgiving vision of the promised land.This is a world informed by the constant grieving memory of the Old World and bythe monstrous, beating presence of the New. Dybek’s rendering of this place is tender and unapologetic, without judgment or blame. He explores his people’s lives from within, tracing their threatened sense of identity, the desperation of their survival strategies, the terrifying nearness of madness and despair,the saving presence of humour and the luminous presence of love. This is a vital landscape: industrial decay, rust and crime, dark alleys and abandoned warehouses are seen, not as evidence of despair, but as the grand background for real life, which is lived out the way real life is lived out everywhere – in the small intimate spaces between people, during the moments that touch the beating heart. Stuart Dybek, with his vigorous prose, restless intelligence and boundless compassion, has offered us his world, and a piece of our cultural history. Like the great Isaac Babel, Dybek has rescued this world from oblivion. In doing so he has enriched our souls. Stuart Dybek has published three short story collections Childhood and Other Neighborhoods, The Coast of Chicago and I Sailed With Magellan, and two volumes of poetry Brass Knuckles and Streets in their Own Ink. His work is frequently anthologized and regularly appears in magazines such as The New Yorker,The Atlantic, Harper’s, DoubleTake, Ploughshares and The Paris Review. 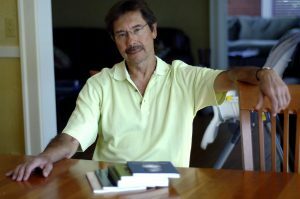 Stuart Dybek’s many honors include the PEN/Bernard Malamud Prize, a Lannan Award, the Academy Institute Award in Fiction from the American Academy of Arts and Letters, a Guggenheim Fellowship, two fellowships from the National Endowment for the Arts, a residency at the Rockefeller Foundation’s Bellagio Center, a Whiting Writer’s Award and four O’Henry Prizes.